The Jewish siddur, the Buddist mantra and Christian prayer all contain repeating elements. Why does our genome also has has so many long and short interdispersed repeats – to give life a stable background on an ever changing environment? Yea, yea. What is similiar to SQL injection (in webforms) and retrovirus infection (of mammals)? I think there is always a vulnerable situation (tainted variable by unexpected data entry – or double strand break and ligation) that allows foreign code to be inserted. What is different? Retrovirus insertion is probably position specific while SQL injection can even determine its own target. Yea, yea. New research in the Lancet of Aug 19 shows that even smoking only 1-2 cigarettes a day increases the risk of acute myocardial infarction in the INTERHEART study – as well as chewing tobacco. Although the investigators tested nearly everything (no benefit also by beedies and sheesha!) they missed Bavarian snuff, yea, yea. -moblog- The next Lancet will publish my editorial on the b2AR and asthma association – “Has all been said?” This is to honour my favorite comedian Karl Valentin “It has all been said – but not by everybody”. I have to confess that I wanted a completely different title “Search and rescue after the avalanche” where I described the tedious work to find all buried corpses under tons of snow – in analogy for the many genetic association studies – fearing already the next avalanche of genomewide SNP scans. Renember – very dangerous – steep 45o slopes, North West and new snow. Yea, yea. -moblog– Eran Segal et al. describe in Nature a genomic code for correct nucleosome attachment of genomic DNA. DNA must be positioned for access to functional sites of gene activity where 147 bases are wrapped around each nucleosome core. AT is favored where phosphodiesterase backbones face inward and GC where it faces outward. Distance between nucleosomes may be variable – as the accompanying editoral by Timothy Richmond explains (the enigmatic histone H1 question). Do genomes use nucleosome DNA preference to target transcription factor towards appropriate sites? This might expain why current transcription factor models are rather poor as they are using only sequence binding matrices. It reminds me to steganograpy, algorithmic procedures that can be used to hide secret messages in in pictures without affecting the visual impression. Yea, yea. und der Philosophie in Deutschland nicht kennen. senen Kornkammern, wozu es keinen Schlüssel hat? Stückchen Geistesbrot, das ich ehrlich mit ihm teile. Denkens, die sie nicht wagen, dem Volke mitzuteilen. sen tieferen Geist, nicht dessen ewige Seele. chen Leben der christlichen Völker manifestiert hat! des Sacri Palatii gezischelt und gekichert wird, ob z.
und dem bösen, die sich bekämpfen, ist beiden eigen. Ariman, der Finsternis, feindlich entgegengesetzt ist. lich als der einzig Gesunde unter lauter Siechen. ralischen noch im apostolisch-katholischen Sinne. oben, alle sieben Himmel versprechen. dieser Religion so viele Mühe geben! die Dichter ist das christliche Leben im Mittelalter. nicht kennt, so will ich sie erzählen. Diese Geschichte bedarf wohl keines Kommentars. alles, was süß und lieblich war, als Teufelei verschrie. abstraktes Gespenst, in der blühenden Natur umher. berwesen selber erhielt bei euch eine heitere Gestalt. Hand und küßt ihn hinten, wo der Rücken aufhört. Asche, neben dem verglimmenden Herde. Vieh soll auch von ihnen zunehmen und gedeihen. dennoch frühmorgens ihre Arbeit beschickt finden. nemark, weil sie am liebsten rote “Grütze” äßen. aber keineswegs der Glaube an Zauber und Hexerei. Tinte, aber noch weit mehr vor Druckerschwärze. ich kann nicht umhin, eins davon mitzuteilen. Gesellen beieinander in einer Zeche gesessen waren. Sünde war, und für diese Sünde mußt du Abbuße tun. gen und also keine Sünde ist. nen des Geistes zu vindizieren sucht. Zwerchfell, sondern auch das Mönchstum erschüttern. rer Zeit in direkter Opposition steht. Intentionen nichts Sicheres mehr sagen kann. persönlich das wunderbare Deutschland repräsentiert. rischer Mystiker und ein praktischer Mann in der Tat. bloß die Zunge, sondern auch das Schwert seiner Zeit. klauber und ein begeisterter, gottberauschter Prophet. manchmal die göttliche Brutalität des Bruder Martin. sche Kirche an Rom gefesselt, wird entzweigehauen. Gemeinde die quittierte Schneiderrechnung vorhält. so einer scheinlosen Pfarrerwohnung zu finden ist. ganzen Wintertag mein Herz erwärmte. oder, wie man sie ebenfalls nennt, die Denkfreiheit. zu seinem Rotstift und streicht uns “die Freiheit”. mal in die Schranken zu treten. Gelegenheit finde, sich vielseitig auszubilden usw. Roheiten mehr oder weniger hier ankomme! tet, müssen alle irdischen Rücksichten weichen. Heuchler, was hier auf dem Spiel steht, zu gewinnen. Abhängigkeit der Ministerien oder gar der Polizei. ken auch das Wort. Er schuf die deutsche Sprache. chen können, und ihre Sprache wird biblisch sein. das Herz der Zeit. Ihr Ton ist nicht immer sauber. heit, die oft ebenso widerwärtig wie grandios ist. tert auf die Häupter seiner Gegner. in Kampf und Not, aus seinem Gemüte entsprossen. Auf Erd’ ist nicht sein’sgleichen. Fragst du, wer es ist? handlung in dieser älteren Literatur ist romantisch. Menschen eine parabolische Bedeutung legen konnte. Menschwerdung, die Taufe, die Kreuzigung u. dgl. You probably know these 95 theses. If not replace “market” with “science”. World rights granted for non-commercial use on condition that this page remains intact. Rip it, steal it, web it, mail it, post it. This message wants to MOVE! 15. In just a few more years, the current homogenized “voice” of businessâ€”the sound of mission statements and brochuresâ€”will seem as contrived and artificial as the language of the 18th century French court. 24. Bombastic boastsâ€””We are positioned to become the preeminent provider of XYZ”â€”do not constitute a position. 30. Brand loyalty is the corporate version of going steady, but the breakup is inevitableâ€”and coming fast. Because they are networked, smart markets are able to renegotiate relationships with blinding speed. 38. Human communities are based on discourseâ€”on human speech about human concerns. 42. As with networked markets, people are also talking to each other directly inside the companyâ€”and not just about rules and regulations, boardroom directives, bottom lines. 61. Sadly, the part of the company a networked market wants to talk to is usually hidden behind a smokescreen of hucksterism, of language that rings falseâ€”and often is. 68. The inflated self-important jargon you sling aroundâ€”in the press, at your conferencesâ€”what’s that got to do with us? 71. Your tired notions of “the market” make our eyes glaze over. We don’t recognize ourselves in your projectionsâ€”perhaps because we know we’re already elsewhere. 91. Our allegiance is to ourselvesâ€”our friends, our new allies and acquaintances, even our sparring partners. Companies that have no part in this world, also have no future. “See no evil, hear no evil, do not evil: The lessons of immune privilege” is the title of an excellent paper by Jerry Niederkorn in nature immunology. He basically says that there are only 3 human organs that allow foreign tissue grafts: eye, brain and pregnant uterus. If we leave the special situation of the uterus aside, and see the yes as an extension of the brain – there is only the brain that is no attcked by the immune self. 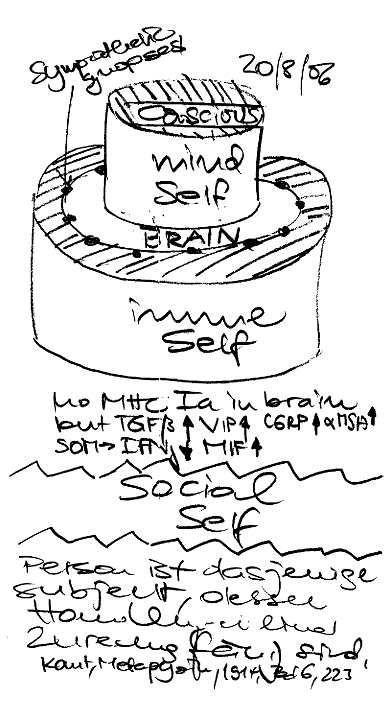 Being still under influence of the Popper/Eccles discussion of the brain and its self , here is my back on the envelope picture of social self < -> immune self < -> conscious mind. Yea, yea. David Wang from the school of Dentistry of UCLA makes an astonishing claim in a company interview about the 1.5 l saliva that we produce every day: “…Real-time changes in our body could be monitored by having sensors to sense changes … implant a tooth with a sensor … that comes into the astronaut’s oral cavity…”. Even genomic and proteomic analytes are possible if we think of recent lab on a chip developments. Yea, yea. Informed consent – what else? Ian Chalmers pointed me to a paper on â€œRethinking research ethicsâ€ by Rosamond Rhodes. She basically argues that protection of the vulnerabale (as a major rationale of informed consent) has been leading over the past decades to a â€œtangled web of research policies that are sometimes at cross-purposes with the goals that they should actually promoteâ€ with current research policies â€œtoo often limit research â€¦ and therefore promote practices that are unethical and unreasonable by being harmful, wasteful or bothâ€. She tries to make this clear with footnote 9 â€œParents should certainly protect their children. But, consider the bicycle riding policy that parents would adopt if they took protection to be their primary parental responsibility. Children would not be allowed to ride bicycles because it would subject them to risk of harmâ€ and so on. While I am always be willing to discuss dogmas, I think that current research policies on informed consent are well developed for many reasons. Voluntary consent in a democratic society is undispensable. Full information is also vital and not only a matter of protecting vulnerables but also of respect of autonomy. Self-determination leaves the proband the choice to participate e.g. sharing the investigators goals or not. Of course we should recognize when â€œinformed consentâ€ is perverted by just filling in another form. With a few exceptions there is no excuse for not having asked for full informed consent. I am even shivering by her view â€œif the Nazi doctorsâ€™ only ethical failure in their treatment of human subjects involved lack of informed consent, their behaviour would have been no worse than that of their fellow scientists around the worldâ€. Does she really want to affront scientist around the world? Or does she want to downplay the atrocities of the Nazis? Coming back to her example – has she ever heard about bike helmets? It is my responsibility to minimize harm for the individual, while allowing movement forward. Yea, yea. Analyzing the log files for this site, I found this page is retrieved frequently every day. Maybe I should expand on this topic?